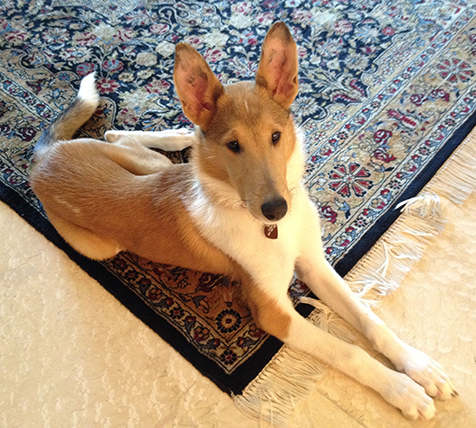 Like the all collie breeds, the Smooth Collie was originally developed for herding. This breed is basically the short-coated version of the Rough Collie. Although the Smooth Collie is recognized in some countries as a distinct breed apart from the Rough Collie, though others lump them together as one breed and claim they are merely variations. The Collie is very well-regarded with other animals. This breed was bred to work in close tandem with other dogs, and generally gets along very well with them. The smooth collie is also very intelligent and trains easily. The Smooth Collie is generally a sociable, easily trained family dog. Although not an aggressive breed, they are alert and vocal, making them both good watchdogs and potential nuisances if allowed to bark. Collies are agile and active dogs and need regular exercise. Training this breed requires a light touch, as they are sensitive to correction and shy away from harsh treatment. They get along well with children and other animals, usually getting along with other dogs. Smooth Collies are used both as family pets and in obedience competitions, agility, herding trials, and other dog sports. Some are still used as working sheepdogs. They are also very useful as assistance dogs for the disabled.